Champions Trophy (Cricket) and Davis Cup (Tennis), the two major events which took place last month had one thing in common. The common factor was Chennai, my hometown. The Champions Trophy cricket was won by Chennai Super Kings and the Davis Cup tie between India and Brazil was held in Chennai. I was in India while both these events took place and was fortunate enough to witness them at a convenient time zone. The Davis Cup was held in Chennai’s Nungambakkam stadium where the yearly Chennai open takes place. The venue was chosen by India’s number 1 player Somdev Devvarman as hard court is his favorite surface and he felt that the city’s heat and humidity will work against the visitors. But when Bopanna took on Thomaz Bellucci who happens to be ranked 27th in the world, the weather in Chennai was uncharacteristically pleasant. The game which was supposed be an easy one for the Brazilian turned out to be a 5 set marathon. Bopanna played a brilliant game and should have won it but mistakes at crucial times in the final set cost him the match. With Brazil leading 1-0, Somdev stepped on the court to face Brazil’s second best player Ricardo Mello. This game was supposed to go India’s way and after the first set it did not seem otherwise. Somdev breezed through the first set and it seemed like the first day will end with the honors even between the two teams. After the first set Ricardo Mello upped his game quite a bit and Somdev started wilting under the pressure exerted by the Brazilian. It was another 5 set epic and another victory to Brazil and India got off to the worst possible start. Brazil would have been thrilled to be 2-0 up after the first day. The decision to play on the hard court seemed to have back fired and it seemed like the Brazilians were not minding the Chennai weather either. After the disappointing first day the onus was completely on the champion doubles team of Leander and Mahesh to keep the Indian team in the hunt. Leander and Mahesh played a brilliant game defeating the Brazilian pair of Marcelo Mello and Bruno Soares in straight sets to get the first victory for India. The third day began with India needing to win both the reverse singles game and boy did they play well. Both Somdev and Bopanna played brilliant tennis to win their respective games to had India one of the most famous Davis cup victories and an entry into the world group. The other major event which concluded just a week ago was the Champions trophy. The event this year was held in South Africa and three IPL teams participated in the same. Chennai Super Kings who were the IPL Champions began their campaign in style when they demolished Central Districts by 57 runs in the opening game. Chennai seemed to have the best team suited to the conditions in South Africa. Their batting was strong and had one of the most balanced bowling attacks for the pitches in South Africa. Chennai just lost a single game in the round robin stage to Victoria and that too in the super over. Things weren’t that rosy for the other IPL teams in the championship. Mumbai struggled for consistency in both batting and bowling and Bangalore had issues with their bowling attack. The Royal Challengers though made it to the semis with the help of couple of big wins as Mumbai Indians made a sorry exit from the event. The Royal Challengers faced the Super Kings in a one sided semifinals where Suresh Raina hammered an unbeaten 90 odd to steer his team to the finals. Bangalore though struggled throughout the game after their strike bowler Steyn injured himself taking a difficult catch to dismiss Hussey. Their bowling and fielding completely fell apart and they allowed Chennai to pile up 170+ in 17 overs. In the end the target proved too much for the Royal Challengers team who succumbed without a fight. Chennai’s opponents in the finals were the home team Warriors who had been brilliant till then in the competition. The finals though again was a one sided affair as Chennai demolished the Warriors batting to dismiss them to a modest 128. Chennai knocked of the required runs without much fuss in 19 overs with 8 wickets still in hand. It was a brilliant win for the team from Chennai and they once again proved that they are one of the most consistent teams in the IPL pack. This was also an emotional moment for the franchise and the players as this was a last game for them as a team before the players will be shuffled again in a fresh auction later this year. In a way this was a nice farewell for a bunch of players who had worked extremely hard and have emerged victorious in the IPL 3 as well as in the champion’s league becoming the first team from IPL to achieve the double. All in all a brilliant win for Dhoni and Chennai Super Kings. Hopefully we will see the franchise carrying this legacy forward, no matter what team they put forward next year. All in all a good month for Indian sports and I had a blast watching all of it during my vacation without the worries of losing my sleep in doing so. Two semi-finals and one final appearance later Chennai Super Kings lead by Dhoni won the IPL title defeating Mumbai at D Y Patil stadium in Mumbai. It was a brilliant win by CSK as they were almost down and out half way through the tournament. Credit has to be given to the captain and the support staff along with the players who showed tremendous mental fortitude to script this turnaround. For Mumbai though this was a day of mistakes as dropped catches and poor decisions with batting order punctuated their performance in the finals. Sachin Tendulkar will be really disappointed as Mumbai Indians were the best side in this IPL. Even though I was happy to see Chennai Super Kings win, I was really sad to see Sachin in the losing side. But in the end Dhoni’s captaincy and Chennai’s superior fielding was the difference between the two sides. When Dhoni won the toss and elected to bat everyone knew that Chennai had the upper hand as teams chasing at the D Y Patil stadium had struggled in the past. The Chennai batsmen started cautiously with Hayden’s continued struggle at the top of the order and with Vijay having to do the bulk of the scoring. But the real push for the Chennai innings came when Dhoni joined Raina at the middle as they both hammered the Mumbai bowlers to set up a competitive total. Mumbai Indians did not help themselves as they fluffed two chances both of Suresh Raina and the Chennai batsman made them pay with an unbeaten 57 of 35 balls. When Mumbai began their chase in the pursuit of 169 to win the IPL III crown Doug Bollinger and Ravichandran Ashwin choked them for runs. Bollinger sent Dhawan early and Sachin along with Nayyar forged a decent partnership but the run rate was well within control for the CSK. Murali, Ashwin and Jakati were difficult to get away and the Chennai fielders put lots of pressure on the Mumbai batsmen. Even though Keiron Pollard’s late flourish gave some hopes to MI chances, Chennai Super Kings won the game comfortably by 22 runs in the end. It was a brilliant display by the Chennai team which was brilliantly led by their cool captain Dhoni. Stephen Fleming the coach of Chennai Super Kings also deserves a special mention along with the other support staff. Chennai was helped by the arrival of the Aussie Doug Bollinger as his presence in the team provided the much needed potency to the bowling attack. Dhoni’s decision to open the bowling with Ashwin turned out to be the masterstroke as the youngster responded brilliantly to finish as the most economical bowler of the IPL III. Suresh Raina as usual was brilliant and the turnaround of Vijay from a correct player to a swashbuckling opener was amazing. Badri was consistent and Anirudha Srikkanth played couple of crucial knocks in the end. Murali and Morkel should not be forgotten as they both contributed handsomely towards the CSK progress throughout the tournament. Dhoni was brilliant with the bat and was very shrewd with his captaincy. 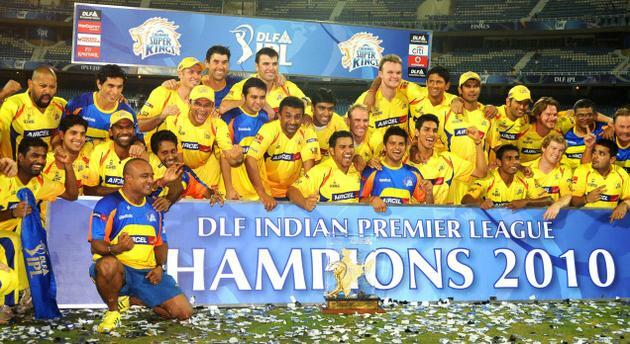 Even though Chennai was not the best team in IPL III but they were the most consistent team across the three IPL’s. They were for sure the most deserving champions in IPL. I am from Chennai and there is no doubt in which team I will be supporting in this year’s edition of IPL. Chennai Super Kings were in the finals last year and I hope that this year they can go one step further. Chennai Super kings have an interesting squad. This year they have added Andrew Flintoff to their ranks. I don’t rate Flintoff too high for his batting but he is a fantastic bowler. The Chennai Super Kings this year have a balanced squad. Hayden will be available for the entire season which will be a big boost for the team. Stephen Fleming will be the coach and the player for the Super Kings. The bowling looks much stronger this year with the addition of Andrew Flintoff. So Makhaya Ntini, Jacob Oram, Balaji, Gony, Flintoff, Albie Morkel and Muthaih Muralitharan form the bowling for the Chennai super Kings. The batting last year was the strong point for the team. Viydut and Parthiv formed a good opening partnership with Raina, Badrinath and Dhoni forming the middle order followed by the all rounder Albie Morkel. With Hayden available for the entire season, this year the selection is going to be a head ache for the Super Kings captain and the coach. Hayden might get into the side and they have to juggle the bowlers a little bit this season. Since the Kings have three all-rounders at their disposal, it’s going to be interesting as to who they are going to pick in the eleven. The four international players rule will make sure that there is going to be just one international batsman who will make the eleven. So that spot will be taken by Hayden. Team: Hayden, Parthiv (Or Viydut), Suresh Raina, Badrinath, M S Dhoni (Captain), Andrew Flintoff, Albie Morkel, L Balaji, Gony, Murali and Ntini. That makes it very balanced squad. They might have few changes here and there during the course of the competition as they have young talents like, Murali Vijay and also Srilankan Thilan Thushara. Jacob Oram might get into the squad once Flintoff leaves. So there is an embarrassment of riches for the Chennai super kings this year. The biggest advantage for the team is having Dhoni as their captain as he was fantastic last year leading both the Indian team and the Chennai super kings. He had limited resources last year and did a fantastic job with the team and with two South Africans in the team he will have a great chance of making it to the final four this year too. Good luck to the super kings and it will be a fantastic learning experience for the Indian youngsters as they will be playing in SA and will be surrounded by greats of the game. They can learn a lot by speaking to the international players and see how they prepare for a game and also learn about the right areas to bowl on wickets which have some pace and bounce for the bowlers. I was looking at the cricinfo round table about the IPL, where the experts said that the Indians will struggle in SA, which is absolute nonsense as we just won the world cup couple of years back with inexperienced players. I guess the Indian players will just do fine there and will surely come back as better and confident players after the IPL is over. Let’s hope that this edition of IPL is as good as the previous year in terms of quality of the cricket games. I know that the atmosphere cannot be matched as the games are not in India but I am sure that the SACB will try their level best to generate interest among the general public in SA. IPL 2 is going to begin in a week’s time and it being held in South Africa has already been well documented in the media. There has been lots of stuff written about the positive and the negative effects of the shift. As for me the only positive thing about conducting IPL in SA is that the tournament will happen and the foreign players will not have any issues with the security. As far as the image of India goes it’s a huge set back. We have big events like the Commonwealth games and the World Cup coming to the subcontinent in the next couple of years and the IPL shift has put both those events in jeopardy. I am not saying that these events cannot happen in India but people will raise concerns citing IPL as the example. In my previous article I had praised BCCI and Lalit Modi for getting the tournament underway albeit in a different location in a very short notice. Lalit Modi did what was best for the tournament to happen. You can’t blame him or the BCCI for wanting the tournament to go through without interruption. Yeah they could have done some modifications to the tournament by cutting down the games and by juggling the venues here and there to suit the elections but still they needed support from the government. The Indian government is equally to be blamed on this move. I am sure it was a political decision to make sure that the event doesn’t happen during the general elections. The only way IPL could have happened in India was to postpone it to a later date and cutting the number of games to half as it has to end before the ICC World Twenty20 which starts in June. That would have been tough on the BCCI and most of the players have National commitments coming up in May before the world cup. England will be playing WI in May, which would have made sure that they will not be able to participate in the IPL. Having said that it would have been okay if few players did not make it this time around but would the BCCI have got the necessary support from the Indian Government? That’s a question only Government of India can answer. I guess it was the responsibility of both the parties to make sure that the tournament happened in India. I guess both the BCCI and the Indian government had to sit down and could have chalked out a plan which worked for both of them. Conducting a tournament of IPL’s magnitude would have gone a long way in clearing the security concerns in India. Now with India unable to conduct and provide security for an Indian domestic tournament has left the WC 2011 in a big danger. Already there have been talks of the WC being taken away from the subcontinent after the recent attacks on the Srilankan players in Pakistan. International players do not want to go there and the ICC might have to shift the tournament elsewhere if the situation continues. India needs to be careful as they might isolate themselves from the rest of the world if they aren’t careful. By moving IPL to SA the BCCI have set a wrong precedent and they cannot be blamed totally for that. There will be blame games with each of them pointing fingers at the other but the ultimate sufferers are the Indian fans. IPL not being held in India will be hard on us. Instead of watching Chennai SuperKings in MA Chidambaram stadium, I have to watch it on TV with them playing in Durban or Johannesburg and it will not be the same.